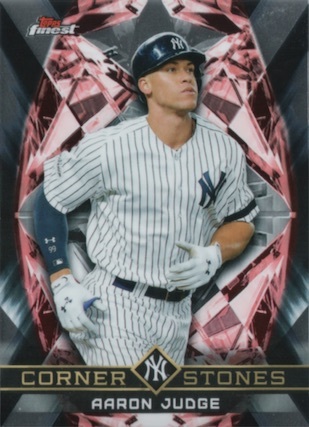 A modern hobby staple, 2018 Topps Finest Baseball lives up to its reputation for elaborate designs, Chrome technology, and Refractor parallels. Packing two hard-signed autographs per master box, 2018 Finest MLB features several new inserts done in the renowned style of the brand. 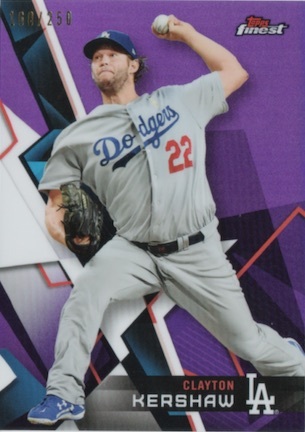 Pushing even more abstract than 2017, 2018 Topps Finest Baseball uses a base design with a lot of action, and several colors. 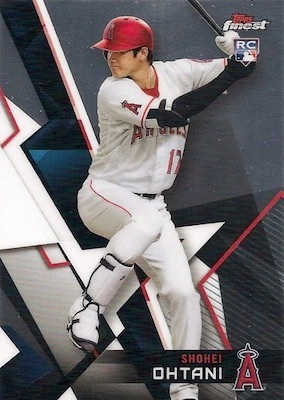 Naturally, there are Refractor parallels for the seasoned players and rookies, including Ohtani, in the main set, plus the various inserts. 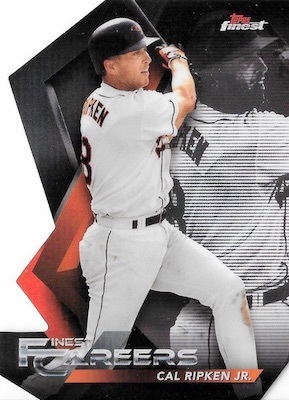 New inserts in the 2018 Topps Finest Baseball checklist include Finest Cornerstones, which puts the current face of the franchise on a design that pays homage to the 1994-95 Finest Basketball Cornerstone cards. 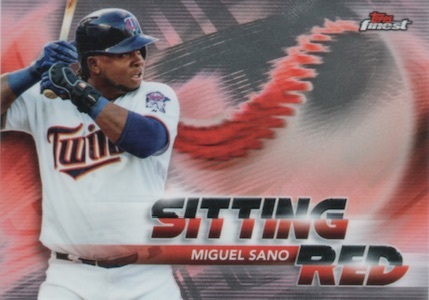 Sitting Red uses the ball itself, and highlights the players that can really mash. There is also the annual Finest Careers Die-Cut insert at two per case. This year honors Cal Ripken Jr. with a 10-card set. 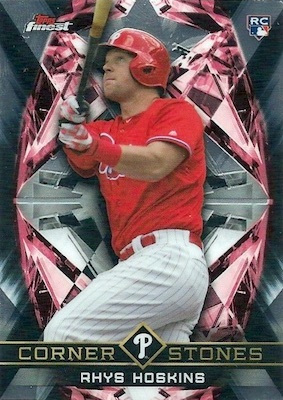 Parallels consist of Gold Refractor (#/50) and SuperFractor (1/1) editions. 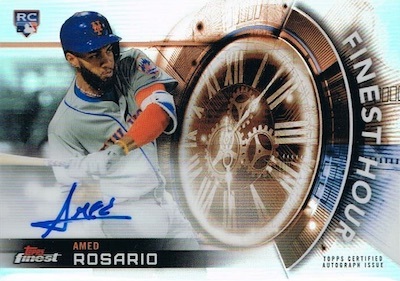 Once again delivering two on-card autographs per box, the signed choices in 2018 Topps Finest Baseball include the main Finest Autographs using the base design, as well as Finest Firsts Autographs for the rookies, and Finest Hour Autographs with a large clock face in the background. 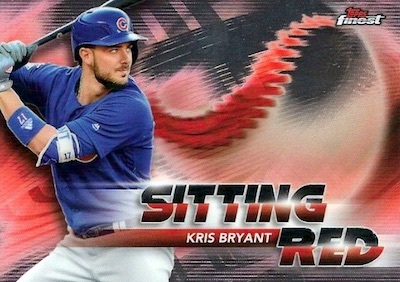 Among the parallels are new Orange Wave Refractors, limited to 25 copies. There are also signed versions for the Finest Careers, Cornerstones and Sitting Red inserts. In addition, Finest Originals presents autographed buybacks from earlier sets. 2018 Topps Finest BO JACKSON Finest Hour On Card Auto Autograph Royals CASE HIT! REFRACTOR PARALLELS: Base Refractor, Purple #/250, Blue #/150, Green #/99, Gold #/50, Orange #/25, Red #/5, SuperFractor 1/1. PARALLEL CARDS: Gold #/50, Red #/5, SuperFractor 1/1. 54 cards. 1:14 packs. Shop autographs on eBay. 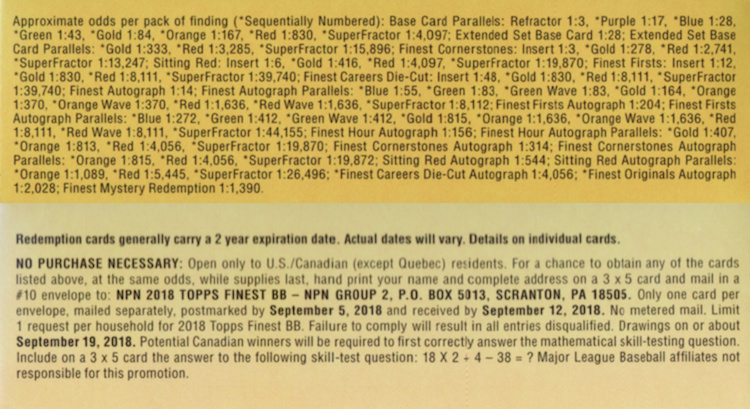 REFRACTOR PARALLEL: Blue #/150, Green #/99, Green Wave #/99, Gold #/50, Orange #/25, Orange Wave #/25, Red #/5, Red Wave #/5, SuperFractor 1/1. 10 cards. Serial numbered #/10. 1:4,056 packs. REFRACTOR PARALLELS: Orange #/25, Red #/5, SuperFractor 1/1. REFRACTOR PARALLELS: Blue #/150, Green #/99, Green Wave #/99, Gold #/50, Orange #/25, Orange Wave #/25, Red #/5, Red Wave #/5, SuperFractor 1/1. 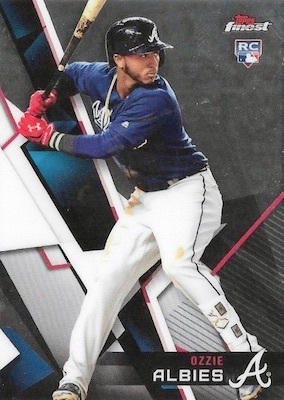 View the 2018 Topps Finest Baseball checklist spreadsheet. Good: On-card content leads the way with two autographs per box; Refractor color pops. 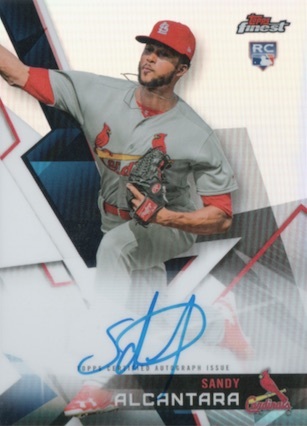 Bad: Designs not as memorable as past years; box felt a little light on color; wish the overall autograph checklist was stronger. The Bottom Line: The long-running MLB brand has seen highs and lows over the years and this is a little bit of a down year for me. 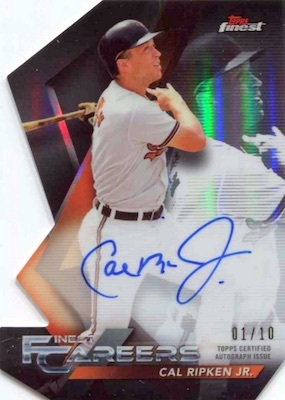 Nevertheless, Finest normally has lasting power and benefits greatly from the Refractors and hard-signed autographs. I generally enjoy the Finest style but 2018 was a little weak for my tastes. The base just had too many shapes that really didn't work together as well. Maybe it was just too abstract. I also feel that most years have an insert design that really catches my eye but not this time. I do like the Finest Firsts over the base design. Overall, Cornerstones is my favorite even though it really doesn't really evoke the 1994-95 NBA design it is based on. It does have the more in-your-face feel that I associate with Finest, though. On the other hand, Sitting Red is somewhat interesting but feels incomplete. To me, Finest is not about subtly, and this should be much bolder. 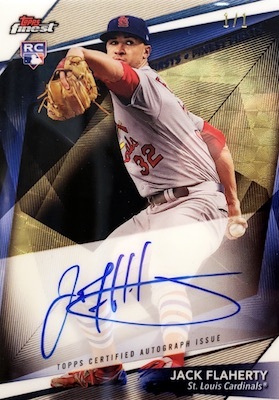 In any event, the hard-signed autographs are always a nice option and certainly give the product an extra boost, as does the Refractor color. 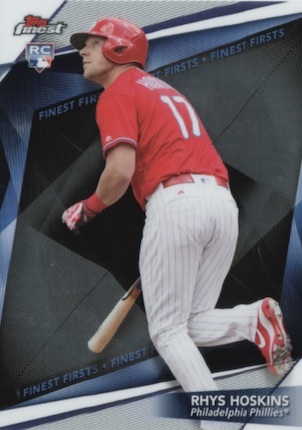 The 2018 Topps Finest Baseball checklist suffers from the same problems found in most sets at this price point. There are definitely some big names, but the majority of the 54-card base autograph set is flooded with low-value names. While the insert autographs feature much stronger lineups, these are also tied to much tougher odds. It doesn't really bother me as much since I am not a set collector, but the 25-card "Extended" set seems extreme on top of a 100-card base set. I know they did it last year, as well, but it still feels unnecessary. At least they didn't SP Ohtani as people would have rioted. Box prices have actually dipped a bit, trending around $100-120 a box at the time of this review. Part of that can probably be attributed to the Ohtani Superfractor being pulled. Although the autographs aren't the only source of value, you likely need two solid signatures or one amazing pull to justify the box cost. The Refactor color is an additional source of value but that can only do so much as boxes contain just a few. I felt a little bit let down with only two color Refractors in the review box. I would think 3-4 per master is a better yield. 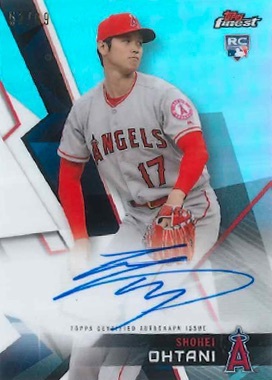 Still, the bigger hits are lurking, including the Ohtani autographs and low-number Refractor autographs, especially the SuperFractor versions. All things considered, I was underwhelmed by Finest this year, which is extra disappointing as it is normally one of my favorites. 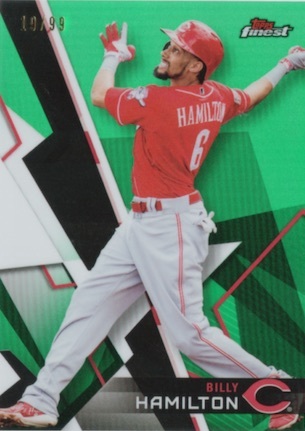 Since Topps sticks to their format so consistently, it can feel a little weak when things don't align. 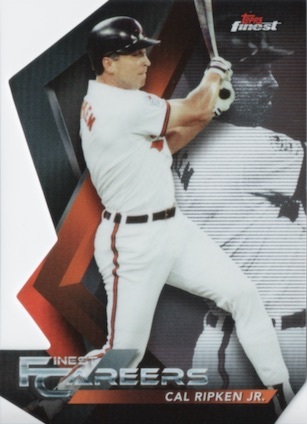 Even though they are bland this year, the Finest Careers die-cut for Ripken in the review box was a nice surprise. Plus, the Albies autograph was actually a tough insert to hit, but otherwise, I mostly found myself wishing that the set had more design excitement. Really don’t like the price point on this product. I’d rather purchase Bowman’s Best for cheaper and to get more auto’s, or Chrome to get more parallels. I don’t think I’ll ever purchase. I’m a fan of Finest. Many times I’ve found that these cards are in fine enough shape to send in for grading. Any idea when the checklist will be available? 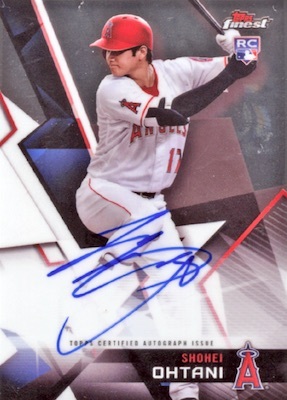 Really curious how many, if any, Ohtani autos there might be. As Baseball Fan, I find the checklist to be terrible if you are a fan of the Marlins, Pirates, Rays or Padres, so little to choose from. Fans of the Rockies, Royals, Mariners, and Giants are hardly better off. As a Yankee fan I love the checklist, also the Ripken chase will be nice. I have 4 boxes on order and cant wait to rip. I will not be doing any random breaks in this Checklist! Trey, any word if the Finest Hour autographs are 1 per case like last year’s Finest Finishes autographs? There has been no specific mention of case-hit autographs that I have seen. We update parallel info as soon as we have. It might not be until the cards release next week. Not a single Marlins base card? Come on Topps. Any pack odds on those Finest Firsts autos? Base, then color? It should be good now. I added the full pack odds at the bottom of the checklist. Thanks for updating. This site is my go-to for checklist info. Can’t wait for next year so that I can buy baseball again without having to mortgage the house. Unbelievable! An Ohtani auto, Machado auto /25, Andujar refractor auto in only three boxes! And a color parallel in every box! For what you have to pay for a box a pretty weak product. One mini had a nobody rookie and then a Sitting Red auto of Paul Goldschmidt Even with his long odds a money loser if you were trying to sell. Colors were Nelson Cruz with a high number and then a nobody color with an even higher number. 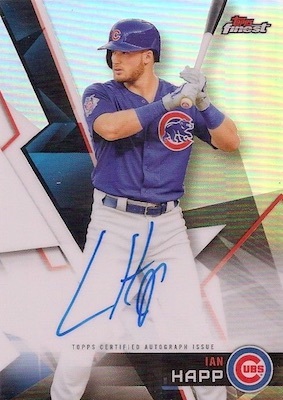 For what you have to pay, Topps should upgrade their autograph list. 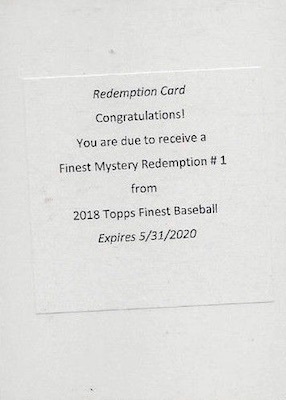 Does anyone know the deal with the 2018 Finest mystery redemptions? I was in a break and hit one (#2 I think). When do the names get revealed? Thx! I broke a case this past Saturday. No Ohtani autos or color but did get a few or his base RCs and one refractor. Some good autos (Yadier Molina orange, Refael Devers gold, Dominic Smith Gold, Miguel Andujar, Amed Rosario, Harrison Bader green) and color as well. I gave 4 stars based on my experience. Always liked Finest!! Opened 5 master boxes and was able to get a full set. Best pulls were a Andujar orange rookie auto /25 and a Kris Bryant Auto MVP Medallion redemption /10. Other auto were decent with more than half in colors. 3 Ohtani rookies and 1 refractor. One of my favorite products. Bought 2 Master Hobby boxes of these 2018 Topps Finest last week & received them today. I was just totally stunned by the 4 autos I pulled from the 2 Master boxes. Paul Blackburn, Tyler Mahle, Dustin Fowler, & the big one a Finest Cornerstones auto of Manny Machado. I also received a SP base card of RC J.D. Davis(card #111) of the Astros. I pulled a total of 19 inserts from the 2 Master boxes as well. I received a total of 24 RC cards including the 3 RC autos. I pulled 3 numbered parallel cards as well. A purple refractor Paul Goldschmidt /250, a green refractor Robinson Cano /99, & a Blue Joey Gallo refractor /150. I did get one Ohtani RC card but as a Braves fan was disappointed to not pull an Ozzie Albies RC card. 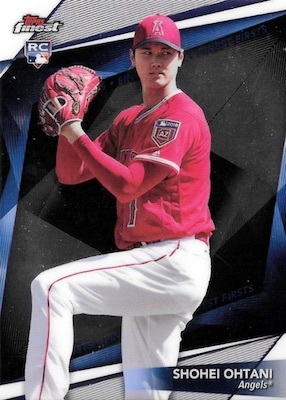 Considering the base card of him is only an extended SP(1:28 Packs) then the odds weren’t good to get his RC card in these Topps Finest cards anyhow. I did pull 3 Freddie Freeman cards(2 base & 1 base refractor). In my opinion, these are some really nice cards but they are a little too pricey though. I did also run into a duplicates problem too from one of these 2 Master boxes. From one of the Master boxes I pulled 10 player duplicates of the same base card. However, the other Master box only had 3 base player duplicates. I watched cases of this stuff get opened so I was pretty disappointed when I hit a Tzu-Wei Lin Green Wave auto and an Ian Happ auto in the first mini box. I’ve never seen a box with 3 autos in it and nobody would believe me if I hasn’t broken it live. The third auto was a Finest Hour Bryce Harper Auto!!! This stuff is great! 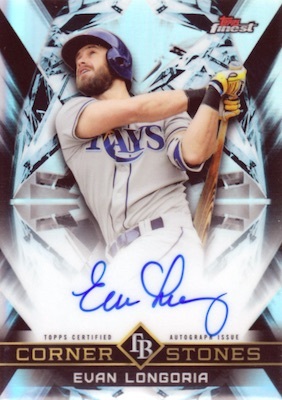 2018 Topps Finest Baseball Hobby Box - Factory Sealed!